Open The Christmas Bible Storybook to meet Mary and Joseph, Angels and shepherds, wise men and, most of all, Jesus! 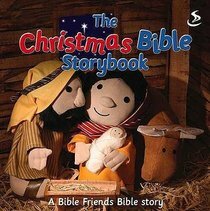 The Christmas Bible Storybook is a truly delightful retelling of the Christmas story, especially for under 5s. It features full-colour photographic spreads of the much-loved Bible Friends characters from the award winning Big Bible Storybook. As a full coloured board book, it is perfectly sized for small hands, with short text for a parent or carer to read to the child. About "The Christmas Bible Storybook (Bible Friends Series)"
This is a full-colour board book, ideal for toddlers and young children, telling the story of Christmas and packed with Bible Friends on every page. Customer Reviews For "The Christmas Bible Storybook (Bible Friends Series)"
This is a wonderful board book to introduce your little ones to the Christmas story. Lovely pictures, and the story is true to the Bible message, based on Matthew 1 and Luke 2. At last a book that shows Joseph and Mary having the sense to move on from the stable by the time the wise men (and who said they were 3 kings?) arrived, when Jesus was a bit older! Enjoy reading this book to your children, grandchildren, and any little person that needs to know Jesus!